Good to drive and nimble in the corners. All the engines get start/stop system. 1.6 TDI with 105PS averages a claimed 74.3mpg. Five Star Euro NCAP rating: 94% adult protection, 89% child protection, 65% pedestrian protection and 71% safety assist. Cars with electromechanical parking brakes cannot be used for the UK driving test. VWG's new, modular EA211 1.4 litre TSI ACT is belt cam, not chain cam. Sat nav cannot find a 7 digit UK postcode. Extreme smoothness and quietness of 1.5 TSI EVO engine is replaced by tyre roar when low profile tyres are fitted. Dealers are telling owners that timing belts of 1.4 TSI need to be changed at 4 years old at a cost of £450. 24-4-2013: Poor fuel of 2.0 TDI economy reported. Owner getting 53mpg from Golf 2.0 TDI when he used to get 62mpg from his Mk VI. 10-7-2013: If ACC front sensor is damaged in a bump very few UK dealers have the equipment to replace and re-set it. Obviously this situation will gradually improve. 17-7-2013: Some UK market mis-builds reported. 537 Golf GT TSI BMT mis-built without features such as electric folding mirrors and footwell lighting. Adaptive cruise control also missing from a number of UK market Golf SE. 31-7-2013: Seems to be a problem of "rattling" rear dampers on more powerful Golf fitted with multilink rear Sports suspension, including the GTI. The fault is with the dampers themselves because it disappears if they are removed. 14-8-2013: Reader reported that rear parking cameras became no longer available due to a supply problem. 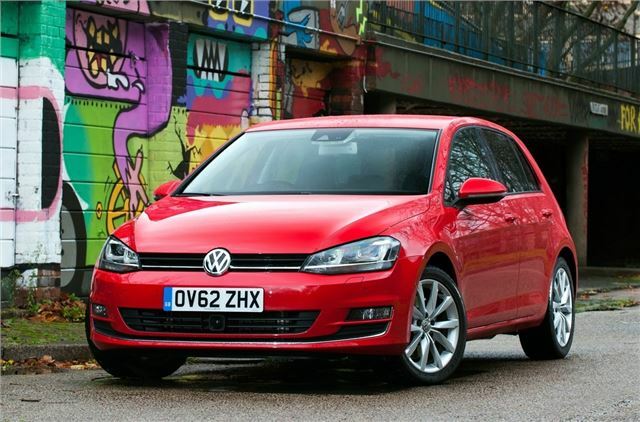 14-1-2014: Total loss of Drive reported in June 2013 Golf SE 1.4 TSI 122PS DSG 7 in September 2013 at 2,500 miles. Whilst driving, slipped from D into N. Engine roared to well over 5,000 revs but no power translated onto the wheels. This is the classic symptom of crystalline deposits fusing the Mechatronics which resulted in the Wolrdwide recall of 2.6 million VAG DSGs built in 2012 and 2013 filled with synthetic fluid. (The recall is to replace the synthetic fluid with mineral.) The transmission was repaired, but failed again in December 2013. Eventually Volkswagen and the supplying dealer agreed to replace the faulty Golf with a brand new car. The warning of imminent DSG failure is a spanner icon that alternates with the 'current gear' indicator at the top right of the multifunction display between the tach and speedo. 1-4-2014: Report of another problem with the ACC of nine month old Golf slamming on the brakes without reason. Required two one-month sessions at dealer including replacing ECU. 4-4-2014: Wet footwells in Golf may be due to drain pipe from a/c coming off. 6-4-2014: Replacement Golf 1.4 TSI DSG promised 14-1-2014 (above) had still not arrived. Reader left driving car that intermittently loses drive. 9-4-2014: Aircon condenser of Golf is vulnerable to stone damage. 26-5-2014: 2013 Golf 1.4 TSI 122 EA211 DSG used 1 litre of oil in first 8000 miles. 29-5-2014: On a 2014 Golf the ACC over-reacted, slamming on the brakes when a plastic bag blew into the radar scanner and the scanner has also braked the car when driving between parallel queues of traffic. 2-6-2014: Report of failure of electric parking brake on 6 week old Golf GTD after five people got out of the car. It stayed parked, then later rolled away and was damaged. Could be that the driver failed to apply the brake properly, so make sure by listening for the whirring as it clamps and look for the red warning on the dash. Wise to always leave the car in gear. 18-8-2014: Complaint of Golf DSG being difficult to reverse and also rolling back momentarily when re-starting on hills. Suggested left foot braking. 26-8-2014: Apparently Golf DSG 7 DQ200s built from July 2013 are not affected by the transmission fluid recall TSB 34F6 as the problem had been identified by then and they were filled with the correct oil on the production line. VAG independents, however, advise fresh fluid after 40,000 miles. 8-12-2014: Reader having trouble with the 'auto hold' feature of his 2014 Golf 1.4 TSI 150 ACT DSG not releasing on drive-off. Dealer thought it was a problem with the rear callipers but it may be the perennial problem with the brake light switch connection to the ECU sticking momentarily on release. 11-2-2015: Reader whose Golf 1.4 TSI DSG was replaced because of problems with the transmission is still suffering hesitation in traffic running in 'E' mode. Might be the fuel she is using. Might run a lot better on Superunleaded. 11-2-2015: Another complaint of comparatively poor mpg from a Golf 2.0 TDI compared to the Mk VI TDI. Suggested the reader try Shell V-Power Nitro Plus diesel that the engne is optimised on for the EC tests. 27-4-2015: Another complaint or jerk on take off when auto hold of the transmission and electric parking brake are used in in traffic, this time in a Golf GT 1.4 TSI ACT. Dealer and Volkswagen Customer Care both say it is a "characteristic" of the system. 19-7-2015: Repeated ECU failure of new Golf 1.4 TSI within the first 3 months. 25-10-2015: MMI system fault reported on 2016 Golf leading to loss of use of radio, sat nav, phone integration and access to some of the car's menus. This issue is apparently common on brand new Golf models. 31-10-2015: Report of difficulty getting a new Golf 1.4 TSI Match into reverse. May be the linkage. May be the box. Back to dealer to fix. 18-12-2015: Reader bought used 2014 Golf TSI 1.2 petrol on February 2015 at 12k miles. Broke down at 20,000 miles. Needed new engine, fitted under warranty. 29-12-2015: Golf needed new rear discs at 2 years old due to corrosion. Electric parking brake pads do not clamp right across the disc and normal braking with the full size pads does not clean off overnight corrosion. £300 to replace, but a good supplying dealer will swallow half of the cost. 19-1-2016: Fairly high oil consumption of 4000 miles per litre reported on new Golf GTD 184 TDI DSG. 16-2-2016: Automatic Cruise Control failed on 12 month old Golf with message "no forward view". Dealer said the radar sensor is satisfactory but requires calibration which is not covered by warranty. This can only be done by dealers who have unique equipment and the charge is £350. 10-3-2016: Faulty gearchange mechanism reported on 2013 Golf 2.0 TDI. After reverse has been used, car sticks in reverse despite lever being moved to 1st. Dealer put it on diagnostics to try to find the fault and, of course, failed to do so. 28-3-2016: Report of 2013 Golf DSG "shuddering a bit as it pulls away". Probably failing clutch pack. 18-4-2016: Speed warning system of 2015 Golf failed and dealer was unable to fix it. 20-4-2016: "Light misting of oil" reported on front dampers of 30,000 mile 2013 Golf at its first MoT. Just an 'advisory'. No need to replace. 27-4-2016: Report of Golf GTD burning oil at rate of 1 litre every 2000 miles and service indicator requiring an oil service every 8500 miles. 5-5-2016: Report of 2016 Volkswagen Golf GTD needing both driver/passenger side front wheel bearings; replacement turbo; replacement timing belt and tensioners. Car successfully rejected. 24-7-2016: Report of clutch of 2013 Golf Comfortline failing completely at 40,000 kilometres. 22-8-2016: Golf production temporarily suspended due to dispute with two parts suppliers: 'CarTrim' that supplies seat components and 'ES Automobilguss' that supplies differential housings have refused to fulfil orders due to a legal wrangle over a cancelled contract. Dispute settled and cars back in production by 28-8-2016. 20-9-2016: Seat stitching of April 2016 Volkswagen Golf R-Line Edition started to fray after 400 miles. Owner took it back to the supplying dealer who blamed the owner for wear and tear. Matter went to Volkswagen Customer Care who also blamed wear and tear (after 400 miles). Owner advised to tell dealer he will have it repaired by a local trimmer and will then charge the dealer the invoiced price, taking the matter to Small Claims if necessary. 5-10-2016: Report that electromechanical parking brake of 2016 Golf 1.6 TDI estate intermittently releases when clutch is depressed to start the engine allowing the car to roll forward or backward if parked on a hill. Dealer initially found no fault, but later fitted a new brake switch and a new CPU, but problem persists. 22-10-2016: Report of battery of 2014 Volkswagen Golf 1.4 TSI failing after 30 months and 11,000 miles. Probably due to the nature of use of the car not charging the battery sufficiently. Recommended switching off the stop start except when on long runs. 11-11-2016: Report of 40k mile 2013 Golf 1.6 TDI DSG failing to go into reverse. Volkswagen dealer initially wanted £4000 to replace DSG transmission, reduced to £3000 after £1000 contribution from Volkswagen. Fixed privately with replaced Mechatronics and dryc clutch pack for £1400. 21-11-2016: Problems with independently purchased 2014 Golf 1.6 105 BlueMotion diesel still under manufacturer warranty: 1) knocking noise from rear suspension 2) fault/intermittent lock on the fuel flap 3) recent struggle to start in cold conditions. 5-12-2016: Report of steering rack failure on 2013 (three and a half year old) Golf. Discount given on replacement part, but a technical exppanation of why it failed was refused by the dealer. 30-12-2016: Another report of a 2013 Golf, this time a 1.4 TSI SE 7-speed dry clutch DSG, autonomously braking to a standstill for no apparent reason. The dealer applied a software update. However again, in October 2016, the car autonomoiusly braked and the car behind nearly hit it. Dealer now said it had a faulty electromechanical parking brake and replaced that. It's possible that this fault is confined to early production Golf models fitted with ACC. 15-1-2017: Report of electromechanical parking brakes of 2015 Volkswagen Golf 1.4 TSI manual initially refusing to release when parked facing upwards on a hill with a wall one foot behind its rear bumper. On 2nd and 3rd attempts car refused to budge. Owner checked doors were securely locked and safety device not employed. Tried a 4th time to drive forward but without success. On taking his foot off the accelerator the car rolled back and hit the wall behind it. On the next attempt the car was pulling against the brake and wouldn't move forward. On the last try the car pulled away completely normally but left with a damaged bumper and boot. Volkswagen dealer denied all knowledge of any fault. 19-1-2017: Complaint of poor standard headlights on Golf 2.0 TDI BMT (not xenons or LED) and of relatively poor 45mpg fuel economy even using Shell V-Power Bitro Plus diesel. 23-1-2017: Another report of ACC jamming on the brakes violently and independently for no reason, this time in a 2015 Golf 1.6 TDI Bluemotion. Owner booked it in to dealer who promptly told him they have no experience of this problem. He was driving on a single carriageway but with 2 lanes of traffic coming towards him the other way and the road bent to his left so that my ACC sensor will have been pointing towards the oncoming traffic. He surmised that my sensors detected traffic in the other carrieageways with a combined closing speed of around 100mph. The ACC performed an emergency stop. 23-1-2017: Report of 2016 Golf 1.6 TDI BlueMotion with 7-speed dry clutch DSG gearbox suffering loss of power when picking up from low revs such as on entering/leaving roundabouts. The car almost dies and the revs drop right away and then it picks up. This can be quite alarming as of course the car slows when other drivers expect it to pick up. The car has been into the supplying dealer on a half dozen occasions but they are unable to trace/find a fault. The reason is usually a sticking brake pedal switch failing to send a message to the ECU that the brakes are off, so the ECU assumes the brakes are on and cuts power until the switch unsticks. 17-3-2017: Report of leaking rear damper in September 2013 Golf. 17-3-2017: Report of engine of new Volkswagen Golf Match 1.6TDI bought in January 2017 cutting out at 5-15mph. Rejected for this reason. 29-3-2017: Complaint that 'brake hold' is unreliable on a new Volkswagen Golf manual, bought September 2016. Owner finds no way of telling when the brake will stick on, but has been sitting at traffic lights and not able to set off, as the hill hold has stuck on. So he switched it off completerly. (It could be that he is not pressing the brake pedal hard enough to engage the brake hold when he comes to a complete stop.) There have been a number of previous complaints about the electromechanical parking brake on the Golf. 14-4-2017: Another report of problems with the ACC on a Golf. In August 2016 just after setting off the car applied the brakes for no reason (very lucky then not to have a rear end collision). A trip to the dealer a few weeks later and owner was told the car's memory was full of errors and the brake application was due to a software fault. A newer version of software that controls front assist and ACC was installed. Owner was shown a technical update detailing this. Owner then had further problems with the front assist system and another unexpected brake application. The dealer has now replaced the front radar sensor and owner is monitoring the situation. 21-4-2017: Report that while a 2014 Golf 2.0 TDI 150 GT was in for warranty work on a door seal, one front damper was found to have failed and the other to be'misting'. Failed damper replaced under warranty. 3-5-2017: Report of 2015 Golf GTI needing new rear brake discs and pads at 12,000 miles. 4-5-2017: Report of failure of 'Infotainment System' of December 2016 Volkswagen Golf Match to turn on or off. Dealer took car in for a day and was unable to fix it. Owner phoned Customer Services and was told there is no software update to fix the problem. Faults with the Golf MMI system were first reported on 25-10-2015, but that's the only other report received to date. 19-5-2017: Burned out clutch reported in 2015 Golf 1.4 TSI at 16,500 mainly motorway miles. 26-5-2017: Report of twin dry clutch pack of 2016 Volkswagen Golf 1.4 TSI 7-speed DSG failing at 10,000 miles and being replaced under warranty. 27-5-2017: Another report of the clutch of a 2015 Golf 1.4 TSI starting to burn out at 23,000 miles. 11-6-2017: Report of 7-speed dry clutch DSG transmission failing in 2013 Golf 1.6 TDI. Goodwill turned down by dealer so repaired independently at a cost of £2,500. 14-6-2017: Report of squealing noise from 2016 Golf Match TSI 125 with 7-speed DSG gearbox at 12,000 miles. After driving in slow dribble traffic for around 30 - 45 minutes the car develops a loud squeal when pulling away, particularly on a hill or slope, and there is an echo of the squealing noise as it changes low gears. Dealer thought it was the turbo, replaced the turbo, to no effect. Owner's wife has same problem with an identical Golf with 7,000 miles. 4-7-2017: Oil consumption problems reported with 2013/62 Volkswagen Golf 1.4 TSI 140 ACT. B urning just over a quarter of the dipstick in about 300 miles. Dealer weighing oil in engine when full, then again after 621 miles (1,000km) to check true consumption. 7-7-2017: Report of clutch pedal of 2013 Volkswagen Golf 2.0 TDI BlueMotion sticking down and car requiring both a new clutch master cylinder and slave cylinder. Likely to be fixed under warranty or goodwill. 11-7-2017: Report of Mechatronics failure in 7-Speed DSG in 41,000 mile 2013 Golf 1.6 TDI BMT. Volkswagen replacing FoC if owner pays labour charge of £303. 23-7-2017: Rear brake discs of 2015 Golf bought used from dealer in April 2017 found to be severely corroded despite Volkswagen dealer claiming to have carried out a 140 point check. Dealer liable. 26-7-2017: Report of Golf diesel bought new 23 May 2013. Warranty work carried out for oil leak at 19,754 on 2 October 2015 by Volkswagen dealer. On 21 July 2017 at 31,000 miles an oil leak occurred depositing it on new block driveway. AA called who established leak from crankshaft area. Car taken to nearest garage who established that there was a lose bolt within the casement which had worn away the crankshaft casement causing the leak. Photo taken of bolt in bottom of casement and damaged part retained. Cost of repair was £660.62. Avised to claim for that, and for replacement of the oiled over driveway blocks. 31-7-2017: Report that after fitting new front tyres the owner of a Golf was "recommended" by the Volkswagen dealer to have the tracking and ACC re-set at a cost of £261. 11-8-2017: Strange electrical glitch reported in 2017 Golf . Driver thought his boot was open. He got out with car in Park with engine running. Alarm sounded with door open. He shut boot. When he got back in car, the sat nav screen was blank. 5-9-2017: Complaint of DQ200 DSG transmission of 2013 Golf 1.6 TDI Bluemotion needing new Mechatronics at 31,000, supplied free by Volkswagen, but dealer charging £178.50 + VAT to fit it. 6-9-2017: Report of auto brake hold function failing and seat belt warning light permanently on in 2013 Golf. 18-9-2017: Report of "misting" (leaking) of both nearside dampers on a 2013 Golf with just 12k miles. Dealer says common fault. Wants to replace all four at a cost to the customer of £1,000. 29-9-2017: Another report of leaking dampers, this time the front pair on a 2014 Golf TDI at 37,500 miles. At 3 year service in September 2016 the dealer reported they were "weeping" and owner was quoted £250 to replace. he declined. Then at 4 year service in September 2017 owner was told they needed to be replaced and the cost was quoted at £600. Owner checked with another dealer and was quoted £430. Readar queried this with Volkswagen and received a letter to the effect that "shock absorbers are influenced by driving style" and are not warranted beyond 6 months. 11-10-2017: Report of 7-speed dry clutch DQ200 transmission of 2015 Golf 1.4 TSI starting to shudder and squeak at 28,000 kilometres. 18-10-2017: Another report of complete failure of Infotainment system in 2017 Golf. Owner took hers to dealer this week when the infotec system completely stopped working. She was told they were unable to fix it as head office said that putting a new one in doesn't solve the problem and at the moment no one knows how to fix it. 27-10-2017: Owner of 2013 Golf 1.4 told by dealer that timing belt needs to be changed at 4 years old, despite only 30,000 miles. Quoted £450. 7-11-2017: Report of catastrophic failure of 1.2 TSI engine in 2014 Golf just 5 months out of warranty due to a bolt coming out of the camshaft. There had been a TSB 15/E7 in July 2015 that would have been flagged up by the VWG diagnostic tool called the Erwin System if the car had been taken to Volkswagen dealers for service. But because the nearest dealers were 45 miles away from the owner's home, the car was service locally and the servicing garage had no access to the TSB and was unaware of it. Because of this Volkswagen will not take any responsibility. 19-11-2017: Report that Golf 2.0 TDI needed a new waterpump at 35k miles and that fuel economy is 48mpg. 22-11-2017: Report of leaking front dampers on 30k mile 2013 Golf. Owner quoted £560 by dealer to replace them. Kwik Fit quoted £340. 23-11-2017: Complaint of hesitation on initial acceleration of new Golf 1.4 TSI DSG. Dismissed as "driver error" by the Volkswagen dealer. 2-12-2017: Further complaint of navigation not always working on new Golf purchased in August 2017. Dealer advises owner it is waiting for a software update. "This situation has been going on for months and all I get are empty promises that it will be fixed soon." 14-12-2017: Report of failure of the Mechatronics of DQ200 7-speed dry clutch DSG in September 2014 Golf 1.4 TSI just 73 days out of 3 year warranty at just 16,000 miles. Total repair cost estimated at £1504 against which owner has been asked to pay a mere £267 (about 18%). We think in view of the constant failures of this transmission Volkswagen should meet the full cost. 22-12-2017: Report of failure of DQ200 7-speed dry clutch DSG on 2013 Golf at 31,000 miles. 23-1-2018: Report of water in n/s front and rear footwells and in the spare wheel well of a 2013/63 reg Golf. Might be that the one-way cabin vent flaps have failed. These are situated between the lower sides of the load area and the rear bumper valence extensions, usually hidden by carpet. Alternatively, the front bulkhead vent well may be flooded because the drains from that are blocked so rainwater has seeped through the pollen filter into the car. 7-2-2018: Report of DQ200 DSG failure on 2013 Golf and replacement cost estimated at £5000. Fortunately excellent local dealer (Johnsons) fought the customer's corner and Volkswagen paid for the replacement transmission and part of the labour cost. 27-3-2018: Mechatronics of September 2016 Golf 1.4 TSI DSG failed in April 2017, in January 2018 and for the 3rd time on 7-3-2018. Volkswagen has offered a complete new DQ200 transmission. 4-4-2018: Report of electromechanical parking brake occasionally failing to release on 2015 Golf 1.6TDI Bluemotion. " When the lever is manually depressed it still does not release. The auto hold is turned off when this happens." Suspect dirt or brake dust in the mechanism. 9-4-2018: Report that when 2014/64 Golf 1.4 TSI in for 38k mile service, owner told that both front dampers and one rear damper are leaking oil. 9-4-2018: Report of new Golf GTD DSG delivered on 11 April 2018 with delivery 120 miles. 4 hours later with 200 miles on it the car went into limp mode. Volkswagen couldn't diagnose the fault and was taken to a main dealer who supplied a courtesy car. 2 weeks later only ECU and injectors replaced but still didn't know what fault was. Then replaced the cylinder head. Now told that have fixed the car. Owner responded he had no conficdence in the car and rejected it. They then came back to me saying they would like him to take the car back and will offer a goodwill, although didn't give any idea of the goodwill offered. It is on finance and the finance are fully aware of the position. 17-4-2018: Report of 2014 Golf 2.0 TDI purchased used 2 months previously suddenly overheating, all warning lights on and into limp mode. Owner got car off the Motorway into a safe place and switched off, then called the supplying dealer who said give Volkswagen Assist a call. Volkswagen Assist thought it was the Water Pump, which is quite common fault and towed it back to the dealer. 18-4-2018: Report of loss of drive in 2014 Golf TDI DQ200 DSG. Suspect Mechatronics problem. 11-5-2018: Report of significant problems with electromechanical parking brake of 2015 Volkswagen Golf either failing to 'auto-hold' in traffic, or seizing on and failing to release. Numerous visits and re-visits to dealer have failed to rectify this. 15-5-2018: Report of Golf 1.6 TDI with DQ200 DSG breaking down with no warning, just the sudden instruction to apply brake while driving. Turned car back on and all seemed fine, put in to gear and 'Gearbox error' message popped up. Roadside assitance ran diagnostics and the following codes: P084100/P189C00 appeared: transmission fluid pressure - function restriction due to insufficient pressure, range / performance = passive / sporadic. Suspect Mechatronics. 29-5-2018: Complaint of red paint chipping badly on front of September 2017 Golf by 11,000 miles. "Supplying dealer doesn’t want to know and a request for an examination by a specialist from Volkswagen UK has been refused." Suggested getting quaotations for rectification and taking to Small Claims. 31-5-2018: Rattling reported from rear suspension of 2015 Golf 1.4 TSI at low speed over uneven surfaces. Volkswagen dealer fitted new rear dampars and top mounts in 2017, but when warmer weather arrived in 2018 the rattling returned. 13-6-2018: Report of 2015 Golf 1.4 TSI DSG estate needing a new DSG transmission under warranty. 15-6-2018: Report of a TSB dealer recall on DSG transmission in 2013 Golf SE Bluemotion TDI because "pressure accumulator can get damaged". 26-6-2018: Report of rumble from rear tyres of 2016 Golf GTD. Definitely not wheel bearings. Possible due to 'stepping' of rear tyres due to failing rear brake compensator. 29-6-2018: Report of stuck shut fuel flap actuator on a 2014/63 Golf 2.0 TDI, now 6 months out of warranty but with a full Volkswagen dealer service hisory. Dealer quoted "not more than £120" to fix it. 22-7-2018: Report of autonomous braking of 2014/64 reg Golf being activated by a carelessly discarded crisp packet from the vehicle in front that wrapped itself around the Golf's radar sensor. 13-8-2018: Lightly driven 2015 Golf 1.4 TSI DSG estate suffered slight judder on changes from 1st to 2nd and needed a new clutch pack at 5,000 miles. Supplied and fitted under warranty. 14-8-2018: Report of 2013 Golf GT TDI 150 suffering three clutch slave cylinder failures, each leading to £150 police tows off the motorway. 4-9-2018: Report of water temperature gauge of Golf TDI warning of overheating occasionally but only when travelling at around 50mph on A-roads. It doesn't come on when on dual carriageway or stationary. If owner takes foot off the accelerator for a few seconds the temp comes down from 130 to roughly 90 degrees. Oil temp stays at 100 degrees. Owner can hear the fan working when he get out of the car, but doesn't know how well it works when moving. Coolant is above the minimum level. Always gets the warning later in the day when the air temperature is a little higher (rather than in the morning when it's a bit cooler). Local garage could not work it out. We think might be a duff temp sensor fan motor switch or might be due to the heat from the DPF actively regenerating too much. 7-9-2018: Report of 2014/64 Golf 2.0 TDI GTD going into limp mode on starting increasing speed slowly to 60MPH then bad juddering, dashboard warning lights: error stop start system; ACC & front assist not available; check oil level (but oil level is fine). After stopping the car and switching off, starts fine and drives 20 miles + no problem. Today took it for an 85 mile run ok on outward trip after the initial stop start but on the return journey it just kept going into limp mode every five miles and would not clear. Also new warning light came up about the handbrake. 8-9-2018: Report of turbo failure on 2014 Golf 1.4 TSI at 34,000 miles. First manifasted itself as failure of the waste gate actuator, which was relaced at a cost of £448, but turbo itself then failed, for which the Volkswagen dealer wanted a further £1,500, even though a new turbo would include the actuator. 10-9-2018: Report of panoramic glass sunroof of 6 week old 2018 Golf R imploding while being driven. Owner quoted £1400 by the dealer to replace it. 11-9-2018: Report of 2014/64 Golf 1.6 Bluemotion going into limp mode after around 100 miles. No warning lights. Fixed by turning off and re-starting. No fault codes left in ECU. 12-9-2018: Report of fuel gauge in Golf still under warranty not showing the correct amount and also a strong smell of petrol. Dealer fitted a completely new dashboard under warranty 3 weeks ago but has not returned the car because the fuel smell is still evident. There was a USA recall of 110,000 mark 7 Golfs for a faulty fuel connection but US Golfs have a different spec. Dealer has spoken to Volkswagen but so far no response. 16-9-2018: Report of numerous faults with 2016/66 Golf 2.0 TDI DSG including USB reader failure, new media unit and software fix, drivers side airbag failure, occasionally stalled when in drive leaving the car with no steering / brake assistance, adaptive cruise / crash sensor failure with new sensor fitted and software reprogrammed, front parking sensor randomly flags up an imminent collision. Front parking sensor and stalling in gear issues persist. The intermittent stalling has not been resolved albeit its very intermittent but a real safety concern. It seems to be an issue with the over zealous stop-start system which kicks in leaving the car sailing towards a kerb across the road with limited ability to brake or steer. The dealer says it cant stall in drive (its a DSG) but we have shown them video evidence of it happening. The parking sensor randomly detects non-existent hazards in slow (<20mph). Dealer has had it in for this reason alone 6 times with 3 attempted fixes where new sensors have been fitted. The last visit is where faults were diagnosed with the adaptive cruise / crash sensors. Dealer offered to take back the car and offered to get rid of £3.5k negative equity in the car's 4 year PCP. 17-9-2018: "Fine oil mist" (enough to case an MoT failure) reported on the front dampers of a 2014 Golf at 45,000 miles. 16-10-2018: Report of 2013/63 Golf DSG losing all drive. Dealer denied any liability. 18-10-2018: Report of media unit of 2013/63 Golf 1.4 TSI ACT intermittently giviing no sound out of the speakers (all the visuals seem to be working fine). Rcently there has been no sound 9 times out of ten. It's been in to the dealer for a service, however all they could do was a software update and re-boot to no avail. Dealer is indicating a cost of £5k to replace the unit. 18-10-2018: Completely separate complaint about infotainment system of 2013/63 Golf: "Infotainment system doesn’t like cold weather. The stereo has a mind of its own. It will skip presets, run through the menu and this is all without driver touching anything. Local dealer unable to find a fault and wouldn’t watch a video of it as evidence." along railings coming from transmission area of 2015 Volkswagen Golf 1.4 TSI DSG at 18,750 miles. 25-11-2018: Report of failure of Mechatronics of DQ200 7-speed dry clutch DSG in 2014 Volkswagen Golf 1.4TSI at 42,000 miles. Owner quoted £2,300 to repair. 1-12-2018: Report of severely leaking panoramic sunroof in late 2014 Golf Estate. "A few weeks ago we noticed internal misting but last weekend the driver's footwell was soaked. Now that the capillary effect is complete, the footwell is drenched and the A pillar is wet to the touch. The drain hole is clear. 1-12-2018: Complaint of sagging driver's seat on 2013 Volkswagen Golf after 22,000 miles. No indication given of size of weight of driver. 5-12-2018: Report of two new October/November 2018 WLTP family owned 2018 Volkswagen Golf 1.5 TSI EVO 150PS models both with 6-speed manual transmission jwerking when pulling away in 1st gear. There is word that a fix for this is on the way, probably arriving early in 2019. 10-12-2018: Report of November 2013 Volkswagen Golf 1.4TSI suddenly starting to use a lot of oil at 75,000 miles. 26-12-2018: Report of 2017 Volkswagen Golf GTD Estate needing new 6-speed DSG box under warranty at 2,500 miles. New transmission seems to be holding its gears for longer and fuel consumption has increased. (May be stuck in 'Sport' mode.) Even at 50mph with 'E' selected box is still holding 5th gear. 2-1-2019: Report from owner of 2016 Volkswagen Golf 1.4 TSI 150 DSG worried that it has developed an intermittent fault where there is sometimes a noise when changing up in the odd number gears. Doesn't noticeably affect performance and seems to happen when the engine is warm and travelling in stop/start traffic. Makes a slipping/grating sound. Reported to dealer who could not duplicate the issue so could noy assist. 3-1-2019: Report of coolant problems with 60k mile 2014 Volkswagen Golf 1.4 TSI. The cam belt and water pump were changed in the last year. Recently, the fan was running much more than normal so he booked a check. The garage say they have found a "sandy substance" in the cooling fluid which they cannot identify. They are saying he should have a three day flush of the system (at £900) in the hope of this curing it. Eventually it transpired that a sticking thermostat that was allowing water to circulate all the time thus reducing output on the heater, and, secondly, that the plastic impeller of the water pump had disintegrated and was the cause of the "sandy substance" that the dealer found in the water. 5-1-2019: Contradictory information about timing belt replacement on 60k mile Volkswagen Golf EA211 1.4TSI engine. One Volkswagen dealer said no need to change. The supplying dealer said it needed a fresh belt at a cost of £450. The original schedule said 133,000 miles. Experience of belt failure had led to this being revised to 40,000 miles. 9-2-2019: Report of ACC of 2016 Golf suddenly failing, car still under warranty. Volkswagen dealer said that if there was evidence of any damage owner would have to pay for ‘recalibration’ of the system. On collecting the car they confirmed that there was no evidence of damage but owner would still have to pay £218 for the recalibration because "the ACC sensor in the vehicle was not fully secure in the locating clips" and that this was the cause of the problem. Owner told that such a problem could be caused by ‘a stone chip or even washing the car’ – if true, clearly ridiculous – and that it might happen again. 12-2-2019: Report of problems with ACC of 52k mile 2013 Golf owned from new and always dealer serviced. Dealer charged £60 to "diagnose" why Active Cruise Control, and Front Assist were not working (dashboad showing light 'ACC and Front Assist not available'. D ealer concluded/confirmed that the (Bosch) radar sensor at front of the car and sited below the number plate was not working and advised that it needed to be replaced at a cost of £1,639.31. (The cost of the sensor was quoted at just over £1200 with the rest for installation and calibration.) Owner decided not to have the work done. A few days later he noticed that the ACC and Front Assist were now fully working and that the warning sign has gone out. The fault might have been caused by moisture ingress. 15-2-2019: Report of turbo issue with 2017 Golf 1.4 TSI. In August 2018 EPC message required Volkswagen assist to recover to garage, turbo waste gate clip was replaced and tested. 10 Feb 2019 EPC message appeared. Green Flag diagnosed turbo issue. Recovered to local non franchise garage who confirmed turbo issue. 20-2-2019: Report of new Volkswagen Golf bought on 19-12-2018 suffering failure of cruise control. Red triangle appeared when owner tried to use it. Owner took beck to dealer after Christmas and has been withoutthe car ever since because "there is a technical fault we are waiting for Volkswagen Germany to send an update." Owner kept calling every Monday and was told to ring Customer Care. This was fruitless and owner was told it could be a week or a year before she got her car back. She called Volkswagen Finance and they have said it could be up until June before I see my car again. Advised to reject the car outright. 26-2-2019: Reader quoted £230 to replace the cabin pollen filter on a 2017 Golf. It's a fiddly job on a RHD Golf, but these filters are available via Google for between £9.79 and £13.74. 28-2-2019: Report of ACC of Golf Estate failing and dealer will not fix it under warranty stating that it has been "physically impacted". (It is in a vulnerable position and could have been damaged by another car when parking.) Owner claiming it is a "design fault and poor positioning" (which it is). Dealer wants £400 to fix it. 19-3-2019: Report of heater matrix of 2015 Golf failing 6 months out of warranty. No goodwill from Volkswagen UK except for a "reasonable" £527 to dismantle the dash and replace it. 25-3-2019: Report of failure of front parking sensor on 2016 Golf still under 3 year warranty. Dealer said must have been hit by a stone and wanted £250 to replace it, plus a further £200 to recalibrate the ACC sensor. Onwer had the job done by a local garage for £160. 2-4-2019: Report of total electrical failure on 2014 VW Golf 1.4TSI Bluemotion, VIN: WVWZZZAUZEW364764. Car stopped, no power anywhere. Hazard lights dim as a candle, dashboard, dead, hatchback could not open.But this happened on a hill and an the electromechanical parking brake could not be used to hold the car either. RAC patrol swapped battery for a new one and all ok.
132 complaints received since model launch in 2012. 08-03-2014: Between the end of May 2011 until early November 2012 Volkswagen was putting mineral oil (G052512A2 which is the same oil they are putting in recalled vehicles now) in their 7speed DSG. That's why 2012 owners don't seem to be part of the recall but 2013 owners are. Also before the 30th of May 2011 VW was using the synthetic oil (G052171A2) they are now switching out which is why owners with vehicles from before were under the 35C1 recall for new Mechatronic and automatically got mineral oil added. This means that while 2012 Mk VI was not subject to the recall, the early 2013 MK VII is. 29-10-2014: Report from a reader that his 2 year old VW Golf Mk VII 1.4TSI 140 ACT has been recalled by VW due to a problem with the two cylinder shut down system. 03-01-2015: Just-Auto.com tells us that Volkswagen of America has announced a voluntary safety recall to check for fuel leaks on 2015 Golf and Golf GTI models and 2014 and 2015 Beetle, Beetle Convertible, Jetta and Passat variants with 1.8T and 2.0T engines. The recall affects about 37,970 cars. "It is possible that a sealing cap on the fuel rail may fail to seal, thus allowing fuel to leak into the engine compartment. Leaking fuel, in the presence of an ignition source, may result in a fire," the automaker said in a statement. Dealers will inspect and, if necessary, replace the fuel rail. 24-06-2015: R/2015/097: Front wheel bearings of Golfs may fail leading to loss of control: Front wheel bearing housings with insufficient hardness may have been fitted. This can lead to a fracture of a wheel bearing housing which can affected the directional control of the vehicle. Fix is to recall the vehicles that are likely to be affected to check the casting dates of both front wheel bearing housings. Where the affected wheel bearing housings are found they will be replaced. VINs: WVWZZZAUZFW312181 to WVWZZZAUZFW318823 and WVWZZZ3CZFE485301 to WVWZZZ3CZFE493159; Build dates: 1-4-2015 to 11-4-2015. July 2015: TSB 15/E7 flagged up by the VAG diagnostic tool called the Erwin System of a possible fault with a camshaft bolt in the 1.2TSI engine. If this bolt comes out it can lead to catastrophic engine failure, so anyone who has been having their Golf serviced outside the VW dealer network needs to take it in to a VW dealer to get this checked. 04-11-2015: EA288 1.8 TFSI and 2.0 TFSI engines recalled in USA because the rear camshaft lobe is prone to unexpectedly shear off from the shaft. The failure causes reduced engine power and loss of vacuum pump power, cutting vacuum supply to the brake booster and eventually resulting in increased braking effort. "A reduction in engine power and/or increased need for braking effort after vacuum reserve has been depleted while driving can increase the risk of a crash," a statement cautions. The campaign affects approximately 92,000 vehicles including the 2015-2016 Beetle, Beetle Convertible, Golf, Golf GTI, Golf SportWagen, Jetta and Passat. In notifying the National Highway Traffic Safety Administration, VAG stated that the root cause of the camshaft failures has not been fully understood. The company is still continuing an in-depth failure analysis and development of a repair solution, however a fix may not be ready until the end of the first quarter next year. WVWZZZ3CZGE512443 to WVWZZZ3CZGE513460; WVWZZZAUZGP067567 to WVWZZZAUZGW908645. Build dates: 25-11-2015 to 14-4-2016. 25-07-2016: R/2016/174: Very limited recall of one month's buiold of VW Golfs because a tooling problem during manufacture could result in the cylinder head not being to specification. It is possible that the fuel rail could loosen and fuel leaks cannot be ruled out. The customer may notice a smell of fuel because of the leak. In the most unfavourable case it is thought possible the fuel could ignite in the engine compartment. Fix is to recall the vehicles that are likely to be affected and replace the cylinder head. VINs: WVWZZZAUZGW255991 to WVWZZZAUZGW262089; Build dates: 1-3-2016 to 1-4-2016. 22-03-2017: R/2017/079: Airbag/belt tensioners may not trigger in event of an accident: Due to an error in the manufacturing process the air bag and/or seat belt pretensioner may not trigger in the event of a collision. Fix: On affected vehicles replace air bag assembly and seatbelt pretensioner where necessary. VIN: WVGZZZ1TZHW015832 to WVGZZZ1TZHW029384; WVWZZZAUZHP016078 to WVWZZZAUZHP552907; WV2ZZZ7HZHH020247 to WV2ZZZ7HZHH084411; WVWZZZ3CZHE029991 to WVWZZZ3CZHP013537; WVWZZZ13ZHV002320 to WVWZZZ13ZHV005588; WVGZZZ5NZHW320847 to WVGZZZ5NZHW847521; WVWZZZAAZHD005939 to WVWZZZAAZHD037356; WV1ZZZ2HZHH002360 to WV1ZZZ2HZHH002373; WVWZZZAUZHW037011 to WVWZZZAUZHW804016; WV1ZZZ7HZHX013663 to WV1ZZZ7HZHX014052; WV3ZZZ7JZHX014827 to WV3ZZZ7JZHX014827: Build dates: 01-05-2016 to 31-10-2016. 7-12-2017: Service update 23W6 started appearing on German VW forums. Nothing to do with EA189 because only affects EA288 in Golf VII and Golf SV. VW told reader it is a replacement Lambda probe (part only with no software update), replacing faulty Bosch probe with an NGK one. Apparently there is an electromechanical parking brake software update 46G7 now needs doing as well.